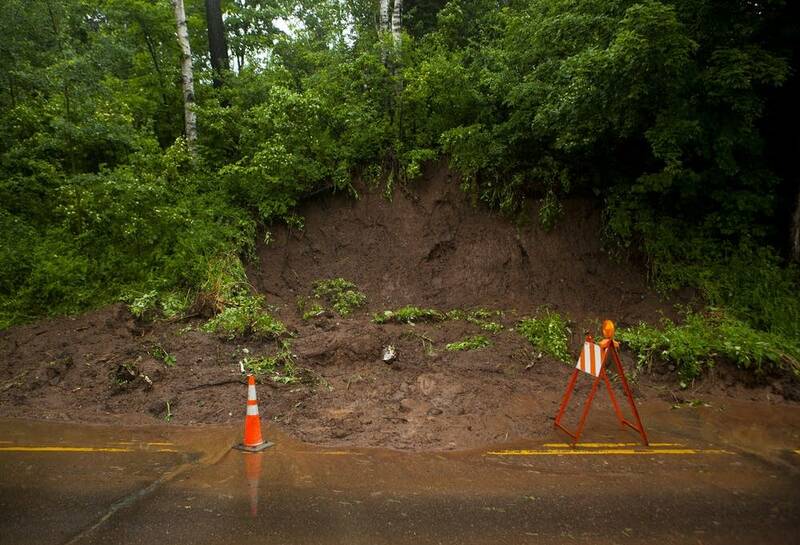 State and local emergency management officials on Thursday will begin to assess the damage in Duluth. 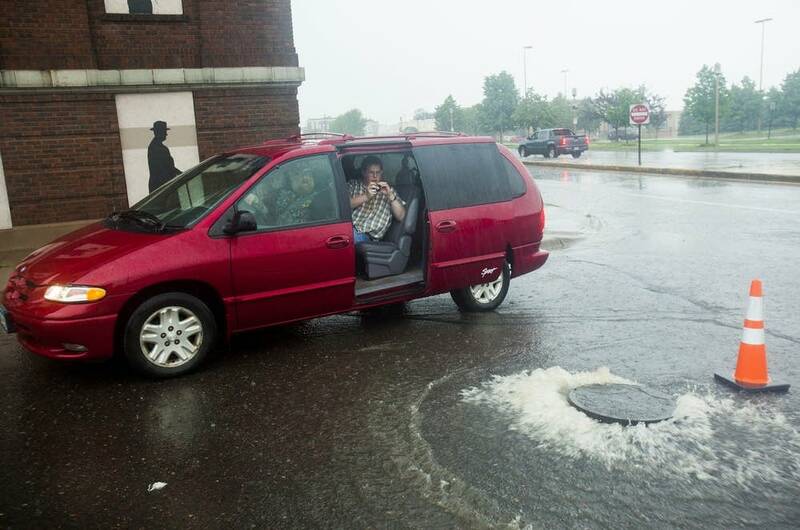 Up to ten inches of rain fell in torrents over the city on Wednesday, flooding rivers and creeks and overwhelming the city's storm water system. 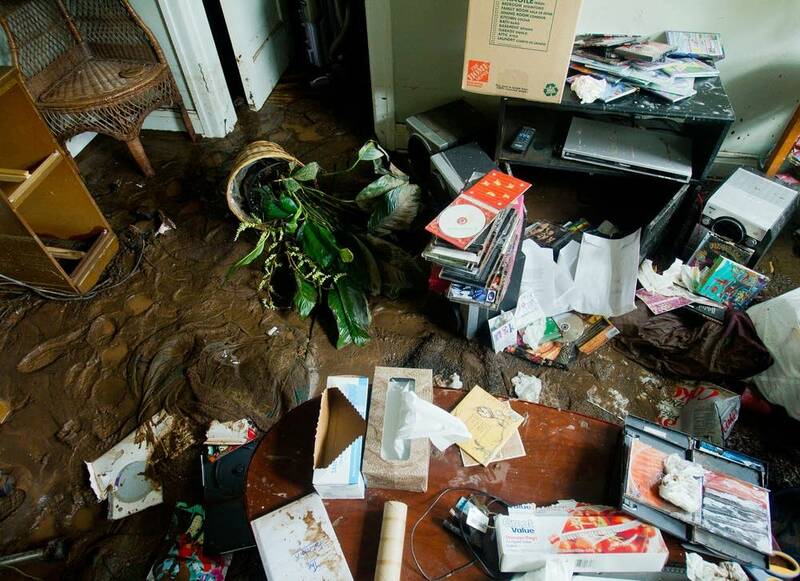 Dozens of streets and highways were closed, giant sinkholes swallowed cars and homes and apartments were flooded. No major injuries or deaths were reported, although there were some close calls and many residents were shaken by the force of the flood. 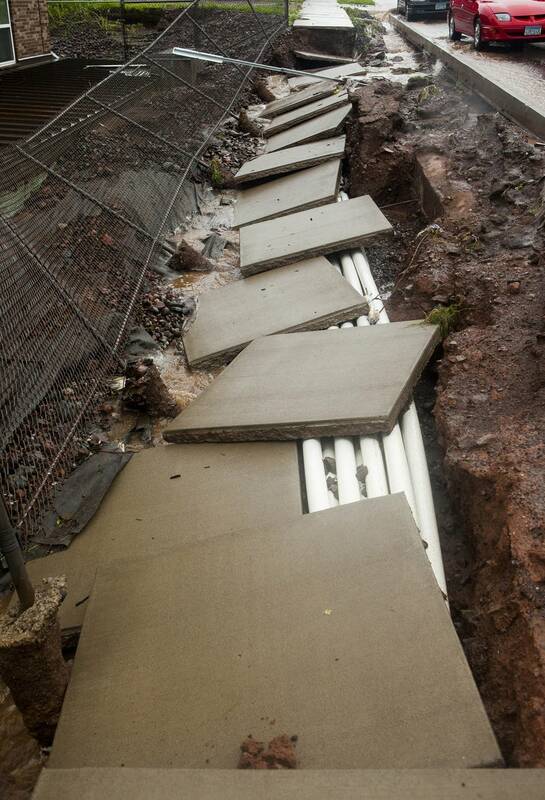 Behind the Whole Foods grocery co-op in the east Hillside in Duluth, about six blocks up from Lake Superior, a retaining wall which stood about 20-feet tall has now been completely washed out. A 25-foot wide hole gapes where a creek that normally runs beneath the parking lot here has totally washed out the wall, leaving a running, muddy torrent of chocolatey, fuming water. "This weather event definitely wreaked havoc on the city of Duluth," said Duluth's Public Works Utilities Director Jim Benning. He calmly scrutinizes the devastating scene Wednesday morning. The city's storm sewer system just wasn't designed to capture the amount of rainfall that fell in such a short amount of time, he said. "Any rain event of this size — you're going to overwhelm even a brand new system, and you can see that was a brand new retaining wall, and that failed," Benning said. When the wall broke late last night, the creek roared downhill toward a small, brick apartment building. University of Minnesota Duluth senior Nicole Kor was in her basement apartment. She had just mopped up a little water that leaked in. "Everything went back to normal, then all of a sudden I heard a gushing noise," Kor said. "And I go and look in my living room and that window right there — water started gushing through the window, because the current was up to here..."
The water reached up to Kor's chest. She threw her cat and cell phone in a bag, stepped outside, and found herself blocked by a rushing stream of water. Her neighbor's boyfriend was there too. "I just remember yelling, I can't do this, and he grabbed me, and I remember feeling him push me, and his strength, his adrenaline must have been out of control," Kor said. Upon returning to her apartment, Kor assesses the damage. Inside the battered door that Kor broke open when she escaped the apartment, a foot of mud and gravel covers the floor. Wearing garbage bags around her feet, Kor and her friend, Hayley Moede, sort through the wreckage. "I don't know if I'm in shock or what. I'm just happy that it's all not completely destroyed. I thought I was going to lose everything." 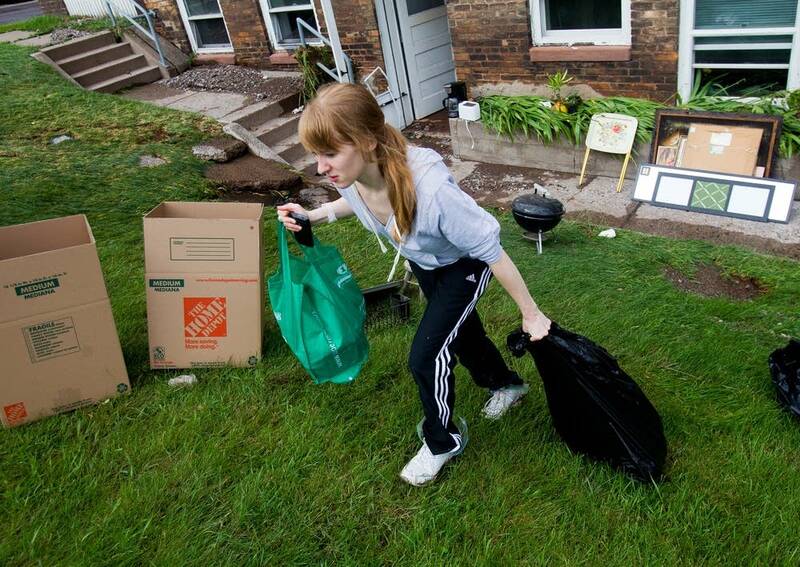 Across Duluth, the surging waters flooded homes and businesses. They tore up streets, leaving slabs of asphalt strewn about, and blew manhole covers into the air. They also created gaping sinkholes in several streets, where broken underground pipes sucked gravel and asphalt down into the ground. Naomi Yaeger cautions a neighbor to be careful as she stands near the edge of a sinkhole, which is easily 20 feet across and 10 feet deep. A car is at the bottom. Yaeger said she took the three passengers into her house last night when their car suddenly sank four feet into the ground. "They were literally driving and just went into a sinkhole, so that just shows you that could happen to anybody; people that were driving around today," Yaeger said. "It's just really stupid, do you think that these people wanted this to happen to them?" Authorities have urged people to stay off the streets. They say roads may still be unstable after the rain subsides. Elsewhere, about 100 people were evacuated in the town of Thomson. Over 200 were evacuated from the Fond du Lac area in far west Duluth. 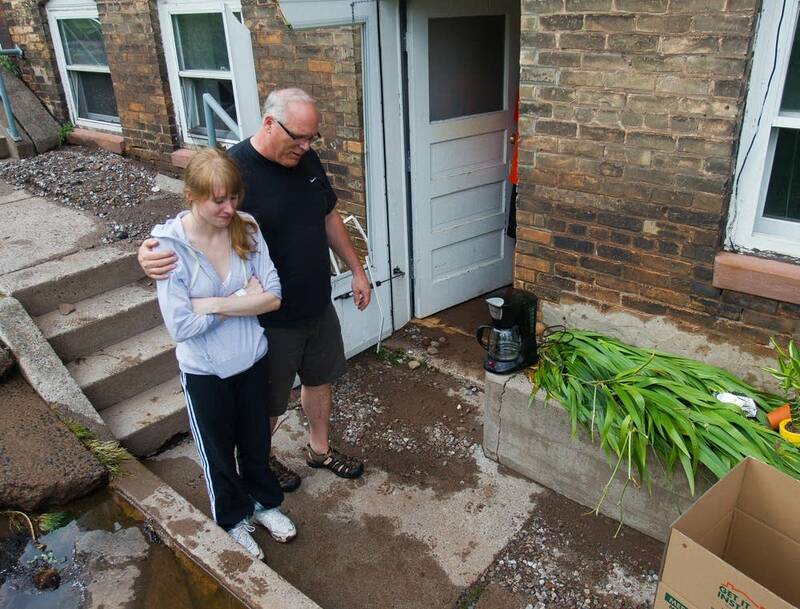 Also in that area, Rob Skutevik, a pastor of the Fond du Lac Community Church, and his family left with the water lapping up his front steps, and those of the church next door. "Of course, you think about how that's going to affect the next few weeks for services, but it will work itself out," Skutevik said. "A church is not about a building anyways, it's the people." 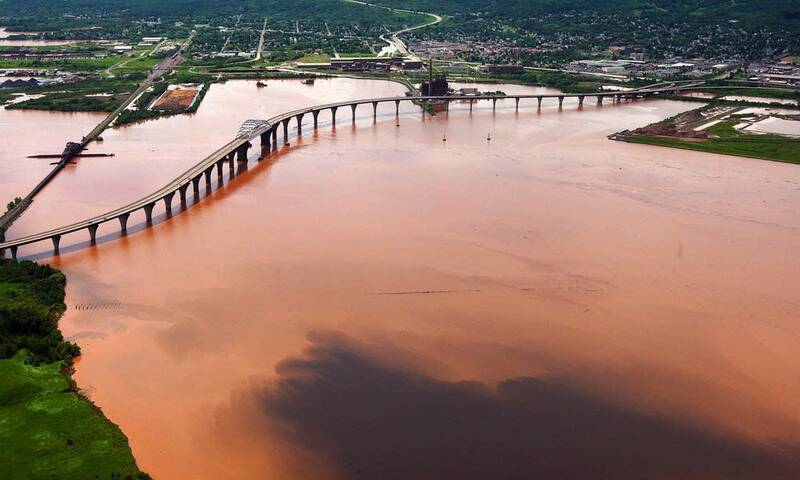 That's the message Duluth Mayor Don Ness stresses — for Duluthians to come together and pitch in, to help clean up a city that's been devastated by the worst flood in recent history.